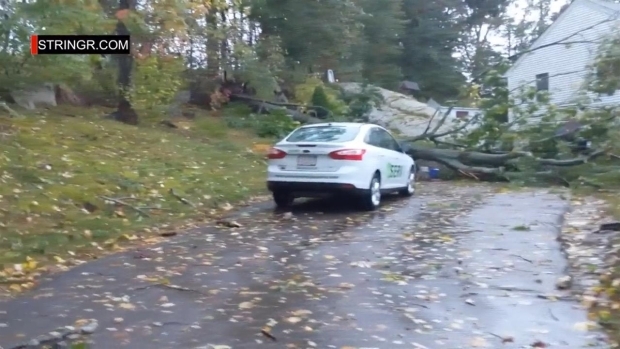 Cleanup continues in parts of New England after a strong storm slammed the area Thursday. Cleanup is underway after a strong storm slammed New England Thursday and spooked several residents. Trees toppled over and debris was left scattered across several towns as a result of the storm. In Milford, several trees caused severe damage. "It sounded like a hurricane," said Hopedale resident Nicole Lathrop. "I thought it was a hurricane coming through. I truly did." Severe storm warnings were issued Thursday for several counties, including Norfolk County, Suffolk County, Bristol County, Plymouth County, Worcester County and Middlesex County. Several New England communities are planning their cleanup process for the storm damage caused by torrential rain. Residents recalled feeling frightened by the unforgiving storm that extended through several towns. "I will tell you, I had a few windows open and the winds became very intense," Hopedale resident Mary Rothberg said. "And, it was extremely loud. Very scary. I ran around closing the windows." A Hopedale Park, a haunted maze set to open soon for Halloween, was toppled during the storm. 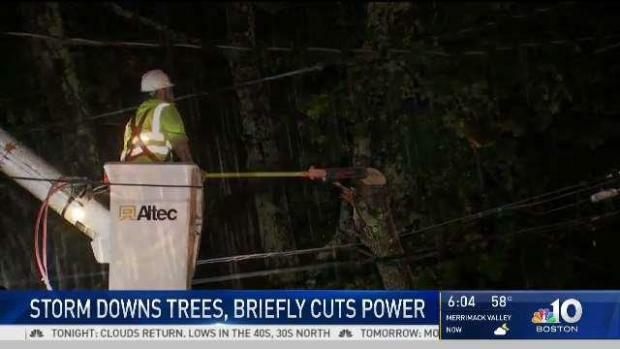 Storms Bring Damage, Power Outages to Mass. 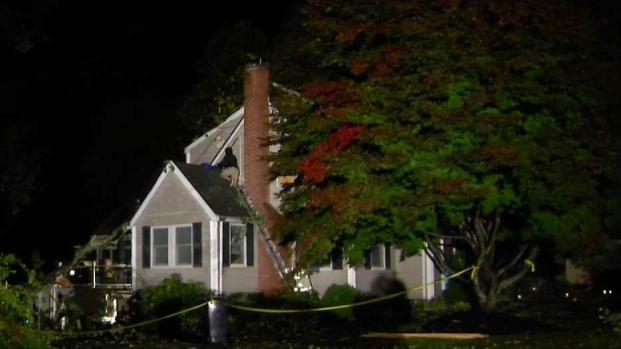 "They were getting it all ready and now it's all damaged," said Hopedale resident Carol More. "Hopefully everybody can pitch in and get it done. Valerie Wild-Owl lives close by and was planning to volunteer at the event. "He had already done a lot of work in a small amount of time so it's kind of sad," she said, speaking of the man who set up the maze. "I didn't realize how bad it was." Thursday’s storms toppled a tree onto a home on Hopedale Street in Hopedale, and caused widespread power outages. The damage extended into surrounding towns, like Milford. Not only was Hopedale damaged by strong gusts and harsh rain, but Bellingham was as well. "They just got home and a tree went boom," said Tom O'Hara, who had a tree fall on his home. "Heard a big boom." O'Hara said he just moved into his home a year-and-a-half ago. 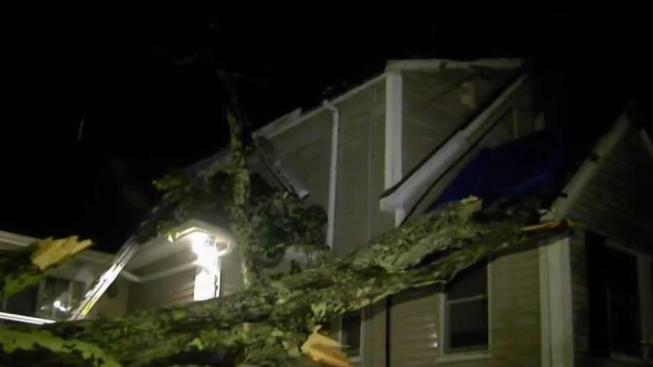 The downed tree damaged his roof and chimney. Tree Down in Milford, Mass. Severe thunderstorms swept through Massachusetts Thursday, causing this fallen tree in Milford, Massachusetts. "The driveway was empty, thank God. Or they probably would have crushed the cars," he said. While homeowners plan what’s next for their damaged properties, crews are working to restore power to the few homes left without electricity. No injuries were reported as a result of Thursday’s storm.